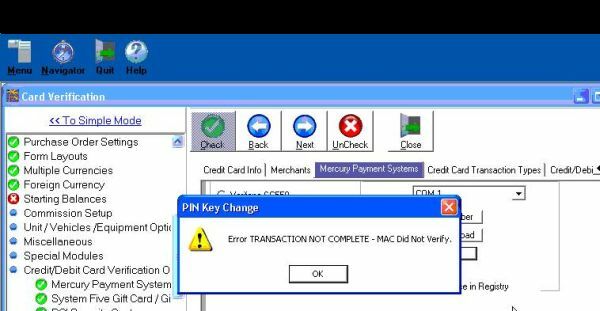 The following article will go over some troubleshooting steps involving the new Verifone VX 810 Pinpad. 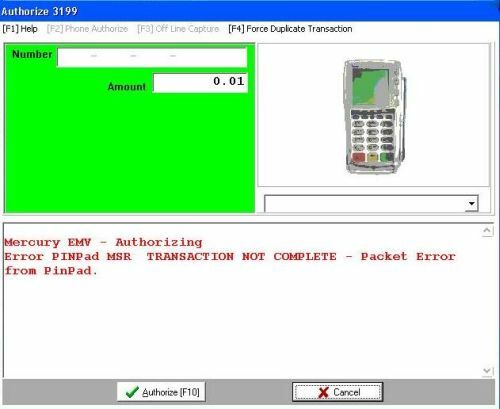 I experienced a few issues with the Verifone VX 810, involving a couple specific errors specific to this pinpad setup. Verify that you have the correct dsiEMVClientX.ocx that matches the datacap Netepay Host. 1. Go to Setup Wizard > Credit/Debit Verification > Mercury Payments > Credit Cards. Verify in the Pinpad ID field, that there is a pinpad ID. Verify Pinpad ID is correct. Check this in Real Windward > Customer Record > Documents, and verify the Pinpad ID is correct in Mercury Payments PDF. If you cannot complete the previous step, ask the customer for the GP (Global Payments) SN (Serial Number) from the device. ie: VBF####. Call Global Payment Systems Canada, and give them the Global Payments Serial number to verify the Pinpad ID. The second error I experienced was the Error Transaction not complete - MAC Error when performing a key change. This error usually means that the Pinpad cannot reset it's pin because of a Pinpad ID/ Serial # issue. To verify the Pinpad ID / Serial #, please refer to the packet error from pinpad issue above..
1. Navigate to Setup Wizard > Credit/Debit Verification > Mercury Payments > Credit Cards. Select Pin Key Change, or Pin Key Reset. This should result in a Success message. Complete two debit transactions. The first transaction will be declined due to the pinpad sequence numbers out of sync. The second transaction should show up as approved. If the pinpads are replacements, ensure that the payment processor has de-activated the old pinpads, and activated the new ones. If the customer is currently using the pinpads that are to be replaced, then it is likely that the new pinpads are not active yet.